Growing up in a family with a great affection for all American cars, it is easy to see why I really didn�t have much choice in the matter and the same could also be said for my son Craig. My first purchase of an American car was in 1990 being a 1964 Coupe DeVille, a RHD Lober car. In the same year I joined the Cadillac LaSalle Club, which for my son and I has been a long and satisfying association and has further developed our appreciation for this wonderful marque, which we all know and love. In early 1995, upon the unexpected sale of the �64, Craig and I spent some months deliberating over what year, model etc. of the 1950�s we would purchase. It was really only after a weekend run to Katoomba in Garry Chivers� �58 Sedan, that we said "this is it! ", a unique model, a dead set Chrome Mobile. 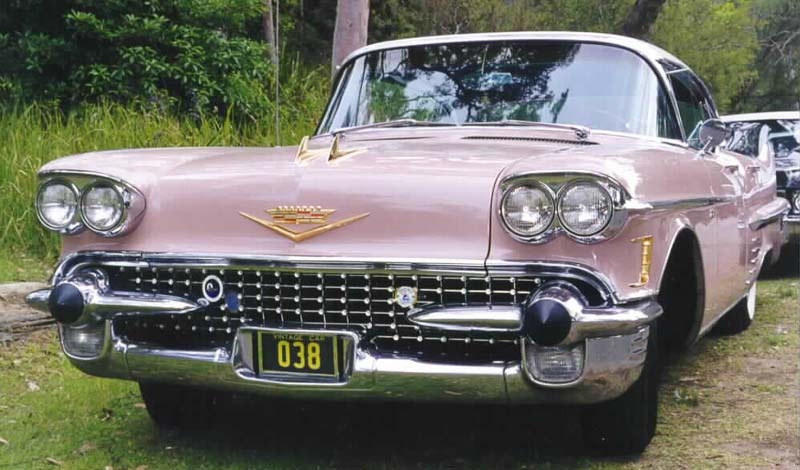 In July of that year, we paid a deposit on a LHD 1958 Sedan DeVille - a one family owned car in good original condition with books and original mileage of just over 100,000. The car arrived at my local garage in October after some of the usual problems you can have in the purchase and transportation of these cars bought "sight unseen". Now in possession of the car, we firstly went through the mechanics, slowly setting about step by step to bring it back to life. As the car had been stored since 1984, we had no idea of what mechanical restoration would be required, but feared the worst. The motor turned over - a good sign, so we dropped all the fluids, flushed the motor and cooling system, replaced all the hoses and clamps, dizzy and points, leads, filters, fan belts etc. and gave it a new battery. It started easily and ran smoothly and lovely despite no exhaust system. We then went through the braking system replacing almost everything. With a new exhaust, shocks and a good greasing, we took to the road test driving up and down the street outside our garage. I�ll tell you what, I was so excited and relieved that we didn�t need to rebuild the motor or transmission. However, this soon balanced itself out with a near total overhaul of the electrical switches, which were corroded or burnt out, possibly due to the car being stored with moisture in the air and the battery connected. This was a tough job. Now that the car was running nicely, we turned our attention to the cosmetics. The car was dead straight. However the paint after a cut back and a buff was only 50/50, so the car was repainted in acrylic, the original colour being "Woodrose Pink" with a cream roof. This job was carried out with my friend Reg (who knows all about old car stripping and painting). After we fitted all the new jewellery items and buffed all the chrome and stainless, I just couldn�t believe how good it looked "just drop dead gorgeous". Friends not into cars at all, couldn�t take their eyes off it. The trim was tidied up with new carpets and a good clean and with the issue of club plates, we were off and running. Since then, the car has proved its reliability with some long runs up and down the coast and continues to attract attention where ever she goes. For Craig and I, it has certainly been a "labour of love" and something we enjoyed doing together. Do it again? Well�not in a hurry. However I know my son has other ideas� and they�re all expensive ones!